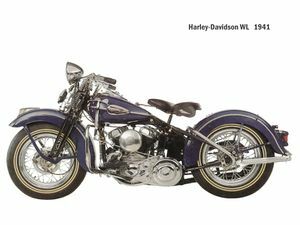 Harley-Davidson, on the eve of World War II, was already supplying the Army with a military-specific version of its 45 cubic inches (740 cc) WL line, called the WLA. (The A in this case stood for "Army".) Upon the outbreak of war, the company, along with most other manufacturing enterprises, shifted to war work. Over 90,000 military motorcycles, mostly WLAs and WLCs (the Canadian version) would be produced, many to be provided to allies. This page was last edited on 19 August 2010, at 13:16.